Evidence for Gods existence and identity. Dear Friend, Can you imagine jumping off the edge of a 10,000 foot cliff without a parachute while screaming, “Gravity is true for you but not for me!” Not unless you’re crazy, right? We all know the law of gravity is true because of the evidence. We drop something and it falls, we trip and we fall. I like to point out to people that my dogs have no idea what gravity is, so they can’t believe in it, but they never float away. Gravity is true for everyone, everywhere, whether they believe it or not. But do you think that any single belief about God can be true for everyone? I have often heard people say, “God is true for you but something else is true for me,” as if the truth about God is just personal opinion. In fact, the Bible claims to be true for everyone, whether they believe it or not, just like gravity. In essence, it warns that leaving this world without heeding the Bible’s crucial advice is more foolish than jumping off a cliff without a parachute. It’s certain that you have some thoughts about God’s existence or non-existence. The question is—do you have any objective evidence to back it up? If not, no matter what you believe, it’s blind faith. If your belief is founded on your feelings or based on what someone else believes, you are in for a surprise. The truth about God’s existence and identity has nothing to do with feelings or what any person or group desires to be true. Truth is discovered, not invented. If you have ever thought your family or friends want you to become a Christian simply because they want you to believe what they believe, you are mistaken. They want you to believe because it’s true. The person who gave you this book cares about you. He or she believes that you deserve a chance to examine the facts with your own eyes and be aware of the Bible’s implications for your life, now and for eternity. 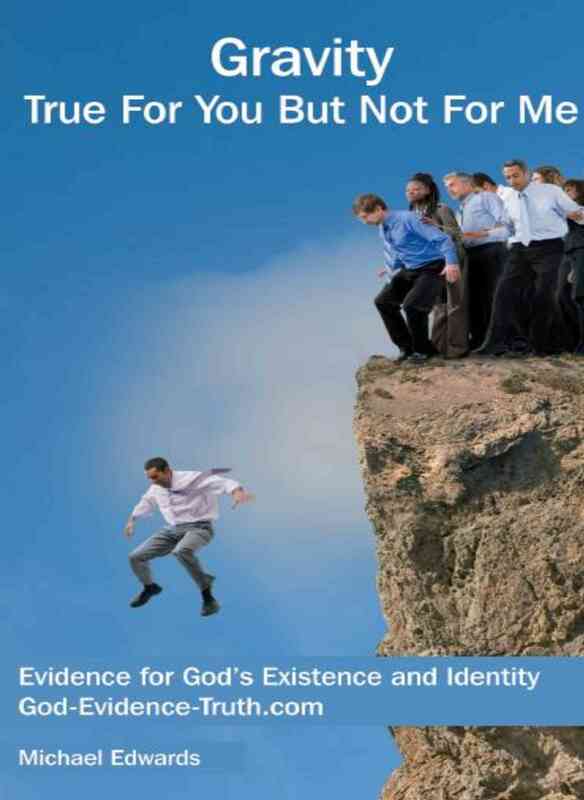 This book is not an attempt to try to force you to believe what Christians believe. Nor does it suggest that you commit intellectual suicide in order to believe in God. It contains sound facts and encourages you to use reason, logic, and common sense to make an informed decision. The Christian faith has a tremendous foundation of scientific and historical support that no other religious belief can claim. These facts are often distorted and ignored by a popular culture which would prefer it to be false. “Christianity, if false, is of no importance, and if true, of infinite importance. The only thing it cannot be is moderately important.” –God in the Dock, C. S. Lewis. Inside, you will find an easy-to-read basic outline of the evidence. So stick with me, as we begin with the fundamentals to determine if truth really exists, what it is and what it is not. Understanding how truth really works is crucial for discovering the truth about God and the purpose of life, so please pay close attention. It is not about religion, it’s about truth.